I have just spent several hours debugging a very annoying issue with the Arduino Pro Minis Watchdog timer, until I finally realized that the fault wasn't in my code, but in the bootloader. The Watchdog timer is used to reset the microcontroller, if it is non-reactive for a certain period of time. The microcontroller can crash or enter an infinite loop for any number of reasons, so an automatic recovery from these states is an important feature. The following simple sketch illustrates the problem. The statement while(1); creates an infinite loop to simulate a crash. The call to wdt_enable(WDTO_8S); sets the Watchdog timer to 8 seconds. So it should blink for a second, go into the infinite loop for 8 seconds, until the Watchdog automatically resets the sketch, and blink again for one second. Instead it blinks for one second, waits for 8 seconds and then sends the bootloader into an infinite reset loop. If the bootloader is in this infinite loop, nothing works anymore. You cannot upload a new sketch and the reset button doesn't work. You have to physically disconnect the power to recover the Arduino Pro Mini. The sketch works as intended on the Arduino Uno which uses exactly the same chip. After a reset that was initiated by the Watchdog timer, the Watchdog is still active and the timeout period is automatically set to a very short time. So the very first thing the bootloader should do is deactivate the Watchdog. Apparently this doesn't happen on the Arduino Pro Mini and the Watchdog times out before the bootloader finishes, which leads to another reset. The Arduino is stuck in its bootloader and the function void setup() is never executed. 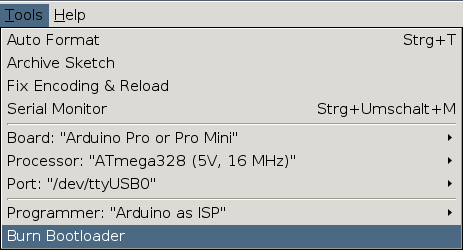 It turns out, that the Arduino Uno, which doesn't have the issue, by default comes with optiboot as its bootloader, but the Arduino Pro Mini, which uses exactly the same chip, does not. The obvious solution is to flash optiboot on the Arduino Pro Mini, which is exactly what I did. At the time of writing it is not possible to add optiboot using the Board manager of the Arduino IDE, but it seems that there is work on the way to make this possible in the near future. In the meantime you can just patch the file boards.txt to point to the optiboot bootloader. It is already used for the Arduino Uno boards, so we just have to copy the settings from there. The above patch can be applied with the following commands. You need to restart the Arduino IDE for the changes to take effect. To flash a new bootloader an ISP or In-System-Programmer is needed. You can buy a cheap one online or use another Arduino. Disconnect everything from the Arduino Uno. 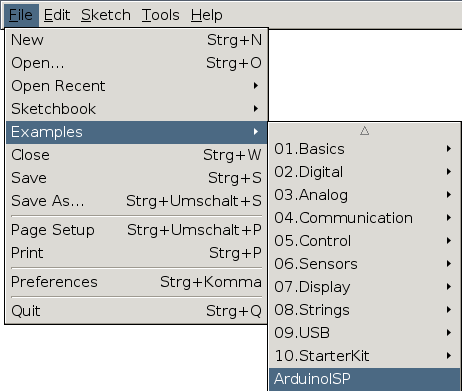 Go to File->Examples->ArduinoISP and flash that sketch to the Arduino. Connect the Arduino Uno to the Arduino Pro Mini as shown below and don't forget to add the 10 µF to 100 µF capacitor between the reset pin and ground on the Uno. The Attiny84 has exactly the same Watchdog issue, but there is a simple workaround. This workaround does not work with the Arduino Pro Mini, so it is still necessary to replace the bootloader. If the first instruction in the void setup() function sets the Watchdog timer to a bigger timeout like for example 8 seconds, the infinite bootloader loop can be prevented. For some strange reason wdt_disable() doesn't seem to work here.